Original Editors -Jason Larimore & Olivia Tefera from Bellarmine University's Pathophysiology of Complex Patient Problems project. Cancer is the unchecked overgrowth of cells in the body. Normal cell lifecycles allow for division, growth, and apoptosis (cell death). With cancer cells, the cell may be damaged or mutated, but instead of cell death occuring, the bad cell keeps reproducing. As a result, a mass of cells, or tumor, begins to grow. The tumor may cause damage from the nutrients it steals from healthy cells, the space it takes up in vital organs, or the pressure it places on important structures. When a tumor spreads to another location in the body, or metastasizes, the tumor still exhibits the same kind of abnormal cells as the original tumor. Therefore, if kidney cancer cells metastasize in the liver, the cancer cells are not classified as liver cancer cells. These "distant" tumors are metastatic kidney cancer cells. The disease is still kidney cancer and is treated as such. As of 2002, the International TNM Staging System was adopted to better understand the extent of patients' diseases and predict outcomes. 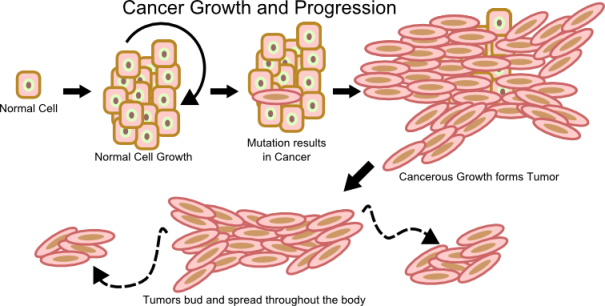 Categories include T: Tumor, N: Node, M: Metastasis. Further primary tumor classification of stages was accomplished utilizing 1-4, with 1 being the least aggressive and 4 being the most aggressive tumor. The most common renal neoplasm in adults is renal cell carcinoma. RCC accounts for close to 90% of all renal neoplasms and approximately 3% of all cancers. Renal cancer occurs 1.6 times more in males than females. The incidence is on the rise, with a peak incidence occurring between 60 and 70 years of age. In 2012, 64,770 new cases of renal cell and renal pelvis cancer were reported in the United States. Due to medical management, the death rate has remained steady. In 2012, 13,570 deaths due to renal cell and renal pelvis cancer were reported in the United States. The classic triad of symptoms includes: blood in the urine, pain in the side, and a palpable mass in the abdomen. However, renal cancer typically goes undetected, especially in the early stages, although nonspecific symptoms like feeling fatigued or unexplained weight loss may be present. Thus, it is imperative that the physical therapist take a thorough history and ask follow-up questions should a patient present with any of these symptoms. It should be noted that although these are symptoms of renal cancer, they could also be symptoms of some other pathology such as an infection, bladder cancer, or a kidney cyst. If a patient is experiencing these symptoms, he or she should contact their primary care physician as soon as possible for a complete examination. About 25-30% of patients have metastatic disease at the time of diagnosis. 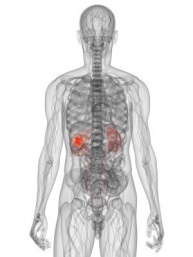 Renal cancer most often spreads to the lungs (75%), regional lymph nodes (65%), bones (40%), and liver (40%). The patient may complain of a cough or bone pain secondary to metastasis to the lungs or bone, respectively. An associated co-morbidity is a disorder or disease that predisposes a person to develop renal cancer. Von Hippel-Lindau (VHL) syndrome: VHL is a rare disease that runs in some families. It’s caused by changes in the VHL gene. People with a changed VHL gene have an increased risk of renal cancer. They may also have cysts or tumors in the eyes, brain, or other parts of the body. Family members of those with VHL can have a test to check for a changed VHL gene. 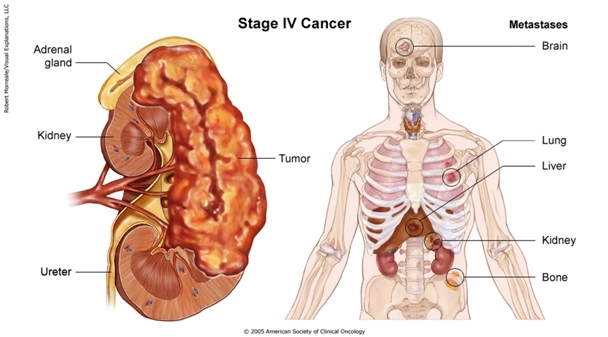 Hereditary papillary renal carcinoma: This is a genetic condition that increases the risk of developing the papillary type of renal cancer, which is the second most common subtype of renal cancer. Birt-Hogg-Dubé Syndrome: This is a rare hereditary disease that affects the skin and is characterized by multiple non-cancerous tumors of the hair follicles, particularly on the face, neck, and upper chest. These bumps will typically appear when someone is between the ages of 20-40 years old. Having this disease increases a person’s susceptibility to developing renal cancer. When possible, surgical treatment to remove the tumor is a preferred treatment method of renal cancer. However, if a person has a metastatic tumor (i.e. cancer that has spread to other organs) the primary care physician will most likely recommend additional treatment. The most commonly used treatments for kidney cancer are various forms of medication from two categories: targeted therapies or immunotherapy. Targeted therapies, which work by targeting the cancer at a cellular level, have expanded the options for the treatment of kidney cancer. Targeted treatments block specific abnormal signals present in kidney cancer cells that allow them to grow. These medications have shown promise in treating kidney cancer that has spread to other areas of the body. The targeted medications Axitinib (Inlyta), Bevacizumab (Avastin), Pazopanib (Votrient), Sorafenib (Nexavar) and Sunitinib (Sutent) block signals that play a role in the growth of blood vessels that provide nutrients to cancer cells and allow cancer cells to spread. Temsirolimus (Torisel) and Everolimus (Afinitor) are targeted medications that block a signal that allows cancer cells to grow and survive. Targeted therapy medications can cause serious side effects, such as: a severe rash, diarrhea, and fatigue. Anyone experiencing these symptoms should contact their doctor immediately. Whereas targeted therapies specifically block the renal cancer cells from growing and spreading, immunotherapy works in a more general way by using the body's immune system to fight the cancer. Immunotherapy medications include Interferon and Aldesleukin (Proleukin), which are synthetic versions of chemicals made in your body. Side effects of these medications include: chills, fever, nausea, vomiting and loss of appetite. Again, anyone experiencing these symptoms should contact their doctor immediately. Urine tests: The lab checks urine for blood and other signs of disease. Blood tests: The lab checks blood for several substances, such as creatinine. A high level of creatinine may mean the kidneys aren’t doing their job. Ultrasound: An ultrasound device uses sound waves that can’t be heard by humans. The sound waves make a pattern of echoes as they bounce off organs inside the abdomen. The echoes create a picture of the kidneys and nearby tissues. The picture can show a kidney tumor. CT scan: A computed tomography (CT) scan both prior to and following administration of intravenous contrast remains the radiologic modality for choice to work up a renal mass. An x-ray machine linked to a computer takes a series of detailed pictures of the abdomen. The patient may receive an injection of contrast material so that the urinary tract and lymph nodes show up clearly in the pictures. The CT scan can show cancer in the kidneys, lymph nodes, or elsewhere in the abdomen. MRI: A large machine with a strong magnet linked to a computer is used to make detailed pictures of your urinary tract and lymph nodes. You may receive an injection of contrast material. MRI can show cancer in your kidneys, lymph nodes, or other tissues in the abdomen. IVP: The patient may receive an injection of dye into a vein in his or her arm. The dye travels through the body and collects in the kidneys. The dye makes them show up on x-rays. A series of x-rays then tracks the dye as it moves through the kidneys to the ureters and bladder. The x-rays can show a kidney tumor or other problems. (It should be noted that IVP is not used as commonly as CT or MRI for the detection of kidney cancer). Biopsy: A biopsy is the removal of tissue to look for cancer cells. In some cases, the patient’s primary care physician will do a biopsy to diagnose kidney cancer. The physician inserts a thin needle through the patient’s skin into the kidney to remove a small sample of tissue. The physician may use ultrasound or a CT scan to guide the needle. Once removed, the tissue is then examined by a pathologist who will use a microscope to check for cancer cells. Surgery: After surgery to remove part or all of a kidney tumor, a pathologist can make the final diagnosis by checking the tissue under a microscope for cancer cells. Age: Being over the age of 40 years old. Obesity: Being obese increases the risk of renal cancer. Hypertension: Having high blood pressure may increase the risk of renal cancer. Hypertension is considered to be present when a person’s blood pressure is consistently measured at 140/90 mmHg or above. Family history of renal cancer: People with a family member who had renal cancer have a slightly increased risk of the disease. Occupation: Coke oven workers in the iron and steel industry; asbestos and cadmium exposure can increase a person’s risk. Gender: Men are twice more likely than women to develop renal cancer. Lungs are the most common location in the body for kidney cancer cells to metastasize. Patients may experience difficulty breathing due to decreased lung function as a result of the space occupying lesions. Significant areas of the lung are removed to extract the tumor, further decreasing lung function. Fever, weight loss, and decreased liver function may result from renal cancer metastases spreading to the liver. Bone pain and improper healing fractures may result from renal cancer metastases invading bone. Brain metastases are the most dangerous because the tumor can compress and damage brain tissue. Removing important brain tissue around the tumor is an option but will lead to further deficits. Patients with renal cell cancer may work with a team of health care professionals to coordinate their care. Smaller mass, less than 4cm. Presence of hereditary disorder related to RCC. Laparoscopic nephrectomy is growing in popularity due to the reduction in hospital stay, postoperative pain, and recovery time. Less invasive options still require further investigation. Patients with small tumors (less than 3 cm) and increased surgical risk due to comorbidities may benefit from percutaneous thermal ablation. Radiofrequency heat or cryoablation may be utilized in this treatment option. Maintaining physical strength is important while undergoing renal cancer treatment and a physical therapist will be able to provide an exercise plan specifically designed for a patient’s needs. Furthermore, if a patient had surgery to remove the tumor, modest exercise can help regain muscle tone and help to rebuild the muscles that were cut, increase that patient’s range of motion, and help to prevent complications that can occur post-surgery such as: respiratory infection, pressure sores, and the formation of a deep vein thrombosis (DVT). Exercise can have the additional benefit of reducing stress and depression, which can be common occurrences in patients undergoing cancer treatment. Physical therapy can also be used to combat fatigue, which is not only a common symptom of renal cancer but it can be a side effect of treatment (e.g. chemotherapy). A physical therapist can work with a patient to build up endurance and reduce the incidence and severity of fatigue. This will be an important factor in increasing a patient’s independence and ability to maintain a high quality of life. A physical therapist can also work with the patient regarding his or her diet, which will play an important role throughout the treatment process. Eating the proper foods can help a patient feel better and give him or her more energy. Furthermore, a healthy well-balanced diet can help the patient build strength, prevent body tissue breakdown, prevent infection, and it promotes the natural regeneration of normal tissues. The following a list of conditions that may present as renal cancer. Quality of life outcomes in patients with localised renal cancer: a literature review. Response of Single Cells to Shock Waves and Numerically Optimized Waveforms for Cancer Therapy. ↑ The University of North Carolina at Chapel Hill: Howard Hughes Medical Institute. Cancer research for drug development: Background information: What is cancer?http://www.unc.edu/depts/our/hhmi/hhmi-ft_learning_modules/cancermodule/pages/cancer.html (accessed 11 Feb 2013). ↑ National Cancer Institute. Kidney Cancer. 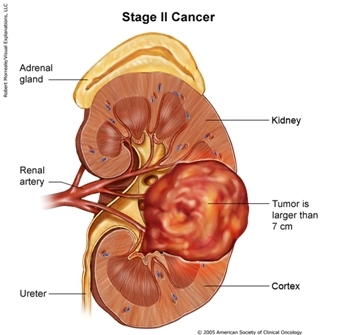 http://www.cancer.gov/cancertopics/types/kidney (accessed 11 Feb 2013). ↑ 3.0 3.1 3.2 3.3 3.4 3.5 3.6 3.7 Goodman CC, Fuller KS. Pathology: Implications for the physical therapist. 3rd ed. St. Louis, Missouri: Saunders Elsevier, 2009. ↑ 4.0 4.1 Kidney Cancer Institute. What is kidney cancer? 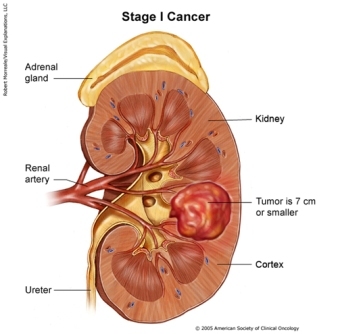 http://www.kidneycancerinstitute.com/what-is-kidney-cancer.html (accessed 11 Feb 2013). ↑ Kidney Health Australia. Kidney cancer information. 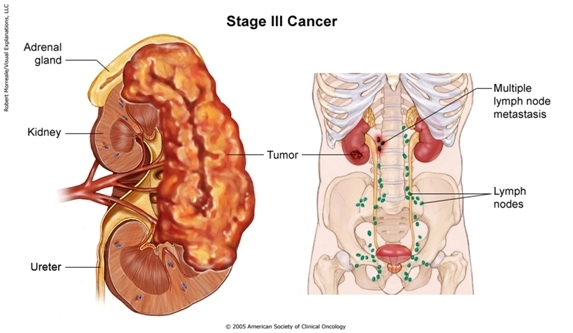 http://kidneycancer.org.au/stages (accessed 12 Feb 2013). ↑ Patel C, Ahmed A, Ellsworth P. Renal cell carcinoma. Urol Nurs 2012;32:182-190. http://www.medscape.com/viewarticle/769848 (accessed 30 Jan 2013). ↑ O’Brien T. Symptoms of kidney cancer - James Whale Fund. [online video]. http://youtu.be/j63MyFqjBVE London: 2009. (accessed 30 Jan 2013). ↑ 8.0 8.1 8.2 National Cancer Institute. What you need to know about kidney cancer: Symptoms. http://www.cancer.gov/cancertopics/wyntk/kidney/page5 (accessed 30 Jan 2013). ↑ 9.0 9.1 9.2 Mayo Clinic. Kidney cancer. http://www.mayoclinic.com/health/kidney-cancer/DS00360/DSECTION=treatments-and-drugs (accessed 30 Jan 2013). ↑ 10.0 10.1 Goodman CC, Snyder TK. Differential diagnosis for physical therapists: Screening for referral. 5th ed. St. Louis, Missouri: Saunders Elsevier, 2013. ↑ Kidney Cancer Institute. Metastatic kidney cancer. http://www.kidneycancerinstitute.com/Affects-of-Metastatic-Kidney-Cancer.html (accessed 11 Feb 2013). ↑ National Cancer Institute. What you need to know about kidney cancer: Treatment. http://www.cancer.gov/cancertopics/wyntk/kidney/page8 (accessed 30 Jan 2013). ↑ 13.0 13.1 Kidney Cancer Association. Living with kidney cancer. http://www.kidneycancer.org/knowledge/live/living-with-kidney-cancer/ (accessed 8 Feb 2013).